The fateful train was already 2 hours late when we departed the train station for the 7 hour journey. We had bought the far more expensive 2nd class carriage with air con..... or so we thought. What we got was a hot carriage with broken air con and locked tight windows. Fans above simply moved hot air around the cabin. The train staff came around with one simple drinks service for the entire journey. In many ways 3rd class really do have the best of it! But of course this wasn't the end of it. The train was continually delayed until we eventually passed Lampung, about an hour or so south of Chiang Mai when the train either hit something or came off the rails! By this point we had been on the train for 10 hours. Over an hour was spent as the train, stood still in the darkness was checked over and over by the staff looking for faults with simple flash lights. Eventually the decision was made to go back to Lampung where a coach would take us the rest of the way. 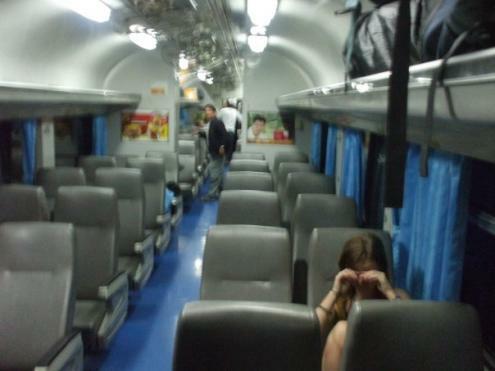 After almost 13 hours without food we arrived after 1am at the Chiang Mai train station; exhausted and starving. As soon as we found a place to stay we headed straight out to find some food. Chiang Mai was still awake but not in a good way. As we followed the road past seedy bars and lady boys stood on street corners, we were not impressed with our first sight of Chiang Mai.